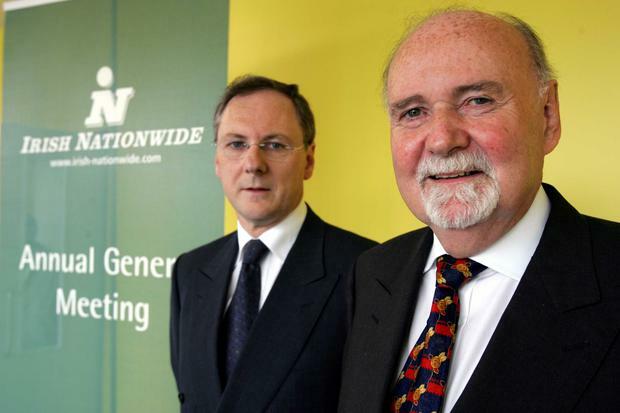 Irish Nationwide's former boss Michael Fingleton and chairman Michael Walsh have blamed an incorrect news story in the midst of the crash for a €1bn run on the lender and said that only a decision to halt lending in 2007 prevented a wider catastrophe at the time. At the Central Bank's inquiry into alleged regulatory breaches at the organisation, Dr Walsh - under cross-examination from Mr Fingleton, who ran INBS for 38 years - described a Reuters story, published on September 5, 2008 as damaging given the "uncertainty". He claimed that as a "result of that run" INBS's deposit book shrank to "about €3bn" from a previous level of €4bn. However he said that as a result of the board's decision to stop all new lending in December 2007, the lender was still able to meet debt repayments at the end of 2008. He said we could "only have done that based on the previous decision". Reuters subsequently withdrew the news item. According to Dr Walsh, INBS had adopted a far more conservative stance than its competitors and claimed it responded to mounting liquidity constraints in the global markets by slamming the brakes on new business. The former UCD professor of banking and finance said the "difference was we were actually building liquidity and everyone else was ploughing ahead in the market". Dr Walsh reached a settlement agreement with the Central Bank in February, accepting a €20,000 fine and a disqualification from managing any regulated financial services provider for three years. In his second day of evidence at the inquiry, he stressed that, at the end of August, INBS had cash in hand of €4bn, representing 40pc of the loan book. However the former chairman and CEO clashed over who had actually made the decision to restrict lending. Mr Fingleton asked whether Dr Walsh could remember the board formally approving an "executive" decision taken in October 2007 to curtail lending. But Dr Walsh replied he could not. The two also disagreed over the timing of board approval of an extension in Mr Fingleton's contract. Dr Walsh said he could not recall discussing the matter with Mr Fingleton at a board meeting in January 2008, just days before the prominent banker was due to step down. Inquiry chairman Marian Shanley asked Dr Walsh whether he recalled proposing that Mr Fingleton should remain on board. He replied he did not. INBS was nationalised in 2010, leaving taxpayers with a €5.4bn clean-up bill.